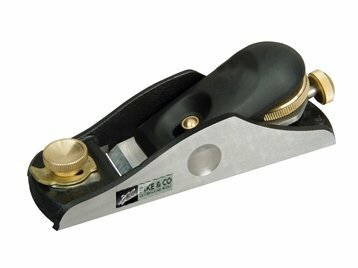 This premium 60 1/2 block plane has the base and frog cast as one, to reduce chatter and the base is precision machined flat to .003in for accuracy. It has a thicker blade (3mm) to reduce chatter, which is made of A2 steel for increased edge retention and stays sharper for longer. The ductile cast iron body withstands drops from the workbench. It also has a heavier body for increased performance and solid brass adjustments for a smooth operation. It has a patented lateral adjustment locking feature for easy adjustment. This plane is particularly effective on end grain and plastic laminates.